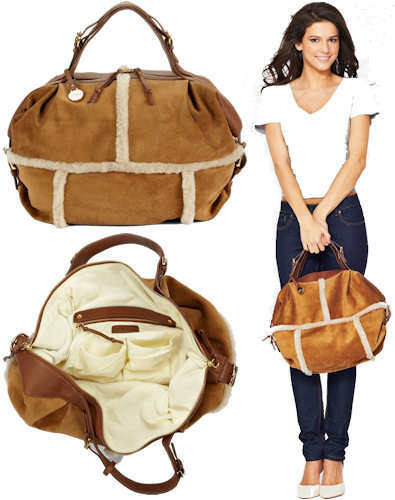 This Ugg Quinn Sheepskin Bag is a large sheepskin shearling bag in chestnut. 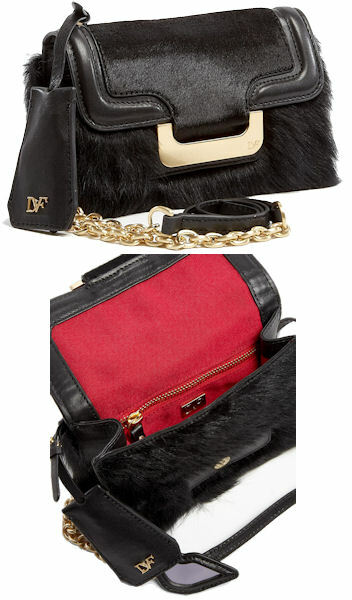 Made by Ugg Australia, the bag is made from top grade shearling and you can see the exposed inner “fur” at the seams. The bag is trimmed in leather and has two top handles and a two way top zip fastening. The Ugg metal branded disc is present, hanging on a leather thong. The sides of the bag are embellished with buckle fastening leather straps. All the metalwork on the bag is gold in colour. Inside, the bag is fully lined in a cream coloured fabric and there is a zip pocket and several pouch pockets and a mobile phone pocket together with an Ugg brand label. This is a spacious satchel bag with shearling accents giving the bag boho chic in abundance. This year’s style has been updated with a pouchy, oval silhouette and this is the perfect bag to carry when you’re out and about this winter. Don’t confuse this spacious bag with the smaller drawstring versions. UK based, UK delivery only, credit available, subject to status. 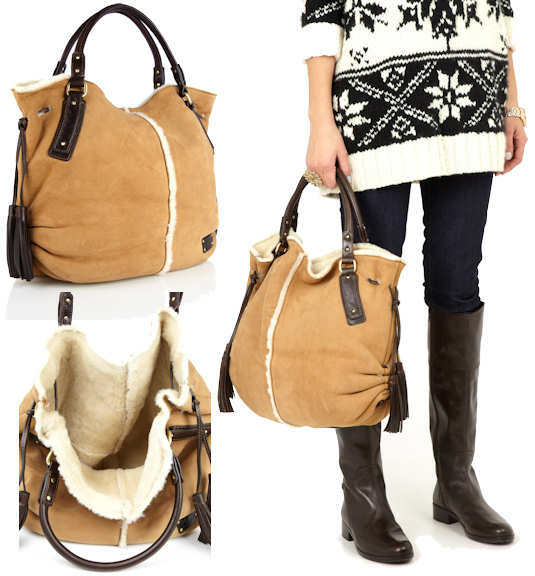 This Ugg Hobo Bag in chestnut is a large sheepskin shearling bag. It has a single shoulder strap, which features embossed leather detail and goldtone rivets, and a removable leather luggage tag, on which is an enamelled Ugg branded metal plaque. The bag has a single compartment, and is fully lined in sheepskin shearling, which is exposed on the outer seams of the bag. Style note: This is a gorgeously spacious tote bag which is perfect for teaming with your Ugg Boots and sheepskin jackets over the cold period. It also ticks all the boxed for the current 1970s revival. Carry it with your denim jeans and oversized knits for casual, laid back, luxurious looks. 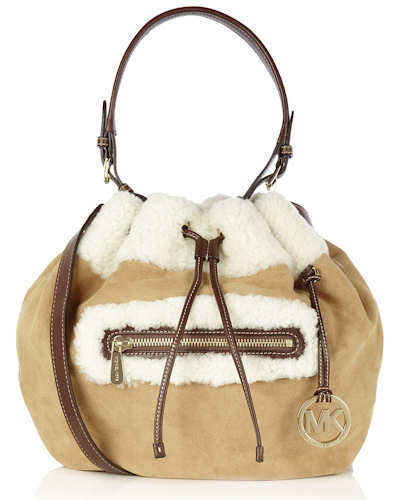 The Michael by Michael Kors Ben Brooke Bag is a pouchy shaped shearling drawstring shoulder bag which has gold tone metal hardware throughout and is trimmed in dark brown leather and shearling. It has a leather drawstring closure and a magnetic fastening at the top. The opening at the top is trimmed with shearling, as is the external zip pocket on the front. The bag also has a signature gold tone MK handbag charm, and the zip pull on the front is branded. The bag not only has a buckled top handle, but also a removable cross body strap for multiple carry ways. Inside, there is a zip pocket, a key fob and the bag is lined in signature beige fabric. There are also four slip pockets to keep everything organised. Style note: Great for the current season’s trend towards 1970s inspired looks, the Ben Brooke drawstring bag will also go beautifully with sheepskin coats and boots, not to mention oversized knits and jeans. It’s great for completing off duty looks with a little designer charm and the multiple pockets are so useful for keeping your bits and bobs organised. 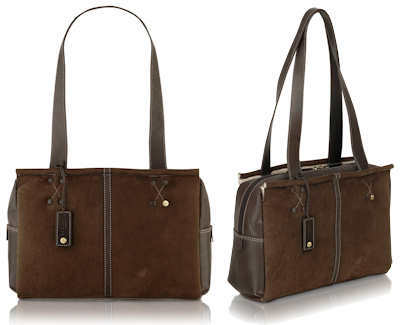 The Radley Forster bag is a large brown suede tote bag with a sheepskin shearling lining and contrast paler stitching. It has two long shoulder straps and a double zip top fastening. The bag has a dark brown leather tag embossed with the words “Radley London” which has a gold Radley dog embossed rivet. There is also a single gold Radley embossed rivet near the base of one of the handles. The bag has “Radley London” label on the back. Measurements: 36.5cm (width) x 24cm (height) x 11.5cm (depth); (all measurements are approximate). Style note: The latest tote from Radley is tapping into the current shearlilng trend, with a beautiful soft shearling lining. This is a bag to be enjoyed. 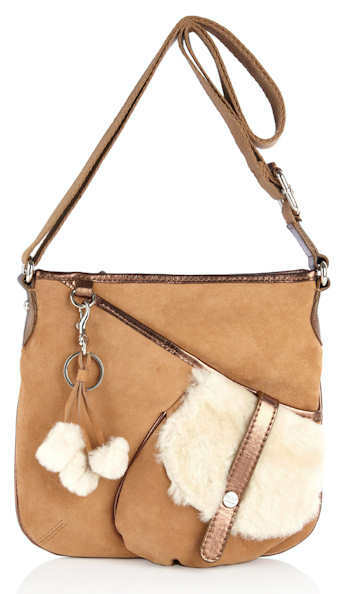 The Ugg Pom Pom Bag is a chestnut sheepskin shearling cross body bag with an adjustable canvas cross body strap. The bag is trimmed in metallic bronze leather and has a top zip fastening. On the front of the bag there is a diagonal pocket with a stud fastening, and on the front of the that, a shearling trimmed flap over pocket which also has a stud fastening. This bag has a delightful removable pom pom key ring handbag charm which clips to the front, and the metallic Ugg Australia branded label is sewn onto the back of the bag. Inside, the bag is lined in signature Ugg Australia material, and there is a zip pocket and two slip pockets inside. Style note: A gorgeous and quirky bag, complete the look with a pair of chestnut ugg boots.